She is “transitioning” to become a deputy director at the Department of Public Works, officials confirm. Morton was singled out (though not by name) in an audit released yesterday for using a city credit card to make thousands of dollars of questionable purchases late last year, including nearly $24,000 to purchase and dry-clean coats for homeless people. Neither Pugh nor Raymond would say whether anyone would be disciplined. Meanwhile, none of the specific expenditures – for warm clothing for the poor, a day of baseball at Camden Yards for the Mayor’s Squeegee Corps – appear to have gone into Morton’s pocket. Rather, the costs stemmed from Morton doing what she did best – making thorny political problems go away for the mayor. This appears to be a reference to Samantha Smith, a participant in the August 2017 Tent City protest that saw 20 red tents pitched outside City Hall, in effect, on the mayor’s front lawn. 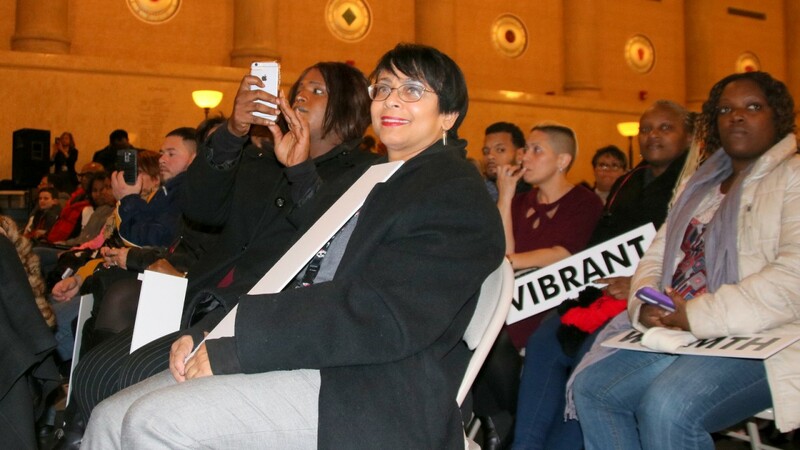 Smith helped end the tense stand-off in which homeless persons, backed by a coalition of advocates, refused to move until the mayor agreed to a set of racial equity and affordable housing demands. 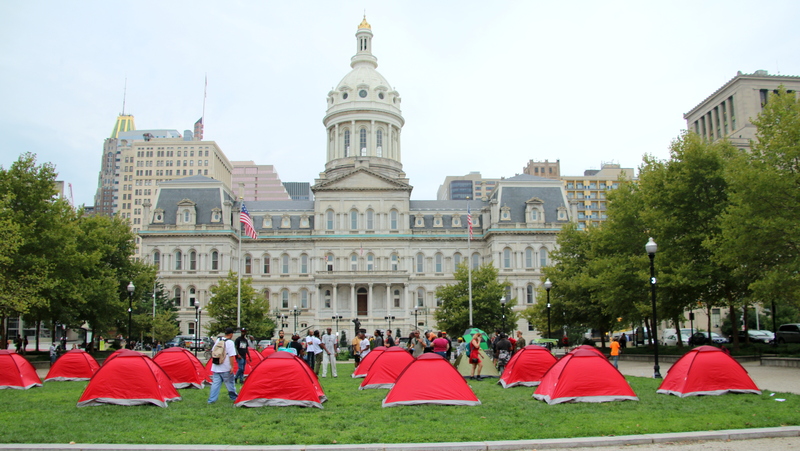 Pugh was already under pressure from business interests to deal with an increasingly visible street population downtown as well as from advocates who called her homeless policies ineffective and her encampment clearings inhumane. The issue had dogged her from the start of her administration when a homeless man was found dead near a bus bench right in front of City Hall. After 10 days of Tent City action, the protesters agreed to leave War Memorial Plaza under the leadership of Smith, an unfamiliar face to local activists. The tent dwellers allowed themselves to be bused to the former William Pinderhughes Elementary School, a dilapidated structure in West Baltimore. A little over two months later, those remaining at the school were told to leave and offered places at the Helping Up Mission on the city’s east side. Smith was given a subsidized apartment and furniture, arranged by Morton, Smith told The Brew last November 3. On that day, as the residents were packing their bags and leaving the school, Smith was on the phone with Morton, she said, discussing her furniture preferences. “NO, NO! The tall one with the two chairs!” Smith was heard to say, while looking at images of furniture on what looked like a FaceTime call. 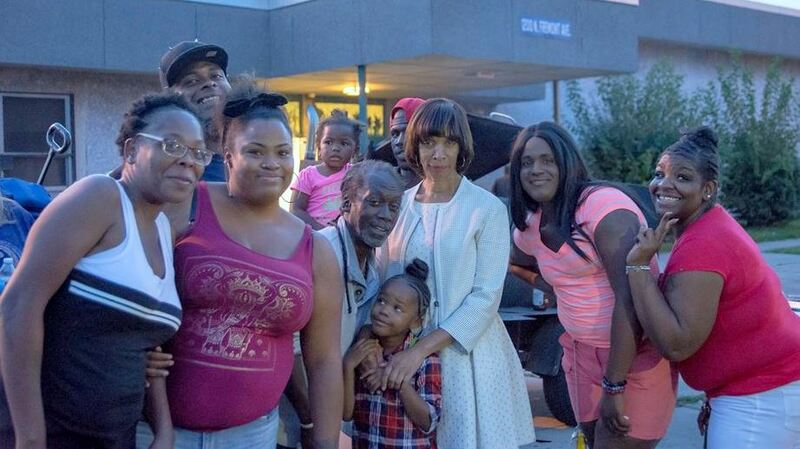 Mayor Catherine Pugh (white jacket) at the Pinderhughes school building on Labor Day 2017. Samantha Smith, who was in charge of the facility while homeless residents lived there, is beside Pugh, on the right. The person who today answered the cellphone that Smith had previously used said the call was made to a “wrong number” and hung up. Attempts to reach Morton by phone yesterday were not successful. Her cell phone was not accepting messages. Morton has been working at DPW for the last week, an agency official said. Asked to confirm Morton’s departure from the mayor’s cabinet and other details, a spokesman for Pugh did not return voicemail, email and text messages. Despite a report to the contrary, Morton was working as the mayor’s chief of staff as recently as last month, assigned to deal with the fallout from the sudden resignation of Mary H. Talley as director of Human Resources. 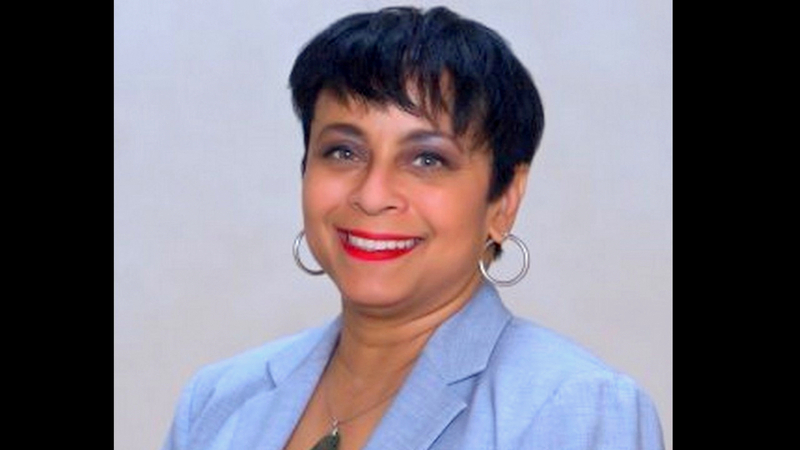 At that time, the mayor’s press secretary James Bentley denied that Morton had left her $183,000-a-year chief of staff job for a brief period in July before being coaxed back by Pugh. Stepping in to oversee the troubled Human Resources Department was one of the “enforcer” tasks Morton took on as the top staffer for Pugh and, in the waning days of the Rawlings-Blake administration, that mayor’s deputy chief of staff. In 2016, Morton played a key role in the involuntary resignations of City Solicitor George Nilson and Inspector General Robert Pearre that arose from a thwarted IG probe of Jerome Mullen, then director of the Mayor’s Office of Information Technology. The disclosure about Morton’s credit card spending comes as part of a 42-page audit that examines the use of procurement cards, known as “p-cards,” by multiple city agencies in 2017 – the so-called Small Purchase Card Program. Another finding was that p-cards were being charged for unallowable costs, such as sales tax and recurring monthly charges. Some of these were minuscule. “A cardholder’s statement, dated June 2017, improperly included sales tax, totaling $.60 to the Baltimore Sun,” the audit noted in the section reviewing the city Housing department. But the most serious problems identified by the audit were “card transactions for personal use, particularly for one cardholder,” namely Morton. • Morton’s spending for furniture was “not allowable” because p-cards cannot be used to purchase items “as personal property or gifts,” the audit said. • The p-card was also used at Camden Yards to buy $513 worth of food and other personal items for members of the Mayor’s Squeegee Corps, the supervised youth group she created amid complaints about young men at intersections asking for money in return for cleaning windshields. • Another $338 was spent on restaurant lunches for which no business purpose was shown. • The largest purchase was a $23,961 charge to cover the cost of buying and dry-cleaning coats to be given away to homeless people at the mayor’s “Fall Festival,” a big-ticket purchase the auditor said should not have been made on a p-card. • To cover the dry-cleaning cost, the credit limit on the card was improperly raised from $15,000 to $40,000, the audit said. In its response in the audit, the mayor’s office said “the cardholder” (Morton) did not request the increase and that “a purchasing agent” approved it. As for who did request the increase, the mayor’s office does not say.